So, When Did Getting A Tan Become Taxing? I remember my first visit to a tanning bed. I was a sophomore in college and did not want my skin to appear day-glow white during spring break. So, a few visits to the tanning bed turned my skin from wintery white paste to sun kissed golden. The tanning bed visits were nice breaks from studying and I often found them relaxing as I felt the warm glow of an artificial sun. So, when did tanning become so taxing? Well, on July 1st, it costs an additional 10% to tan by a tanning bed. And for those who want artificial sun, that is a pretty taxing price increase. This tax is part of Affordable Care Tax Provisions and the tanning tax itself stems from a proposed 'Botax', a five percent tax on Botox cosmetics and other elective surgeries like breast implants. As you may guess, that was not very popular with plastic surgeons, nor the makers of Botox. Law makers changed the 'Botax', but left the provisions for tanning in place. The tax should raise $2.7 billion over 10 years from 20,000 indoor tanning salons across the US, per the Atlanta Journal & Constitution. So, if the customer fails to pay the 10% tax, you are still liable for paying the tax. You may however, exclude goods and services that are not tied to the tax. To remit taxes, use IRS form 720, Quarterly Federal Excise Tax Return. Make sure to include your Employer Identification Number assigned by the IRS. Don't have one? Visit IRS.gov to obtain one. Search EIN. Want to share displeasure with the tax? 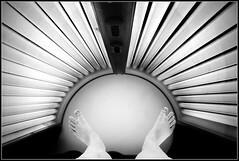 Then visit the Indoor Tanning Association site: www.repealtantax.com to make your opinion heard.